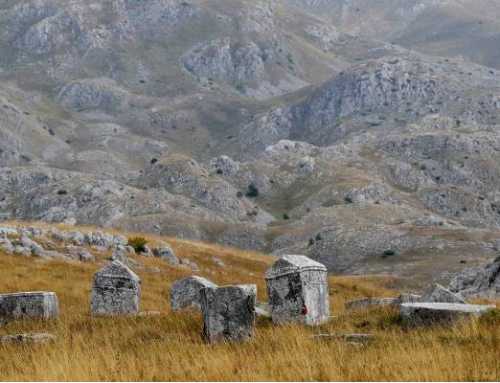 A necropolis with tombstones is situated near the village Donja Bijača, by the Ljubuški-Vid road. In 1931, part of the necropolis was covered by a road or structure alongside, and one decorated tombstone was transported to the Museum of the Franciscan Monastery in Humac in 2003. There are 33 tombstones: 20 chests, 14 slabs and 1 gabled roof tombstone. Seventeen tombstones are decorated. Symbolic motifs include crosses, crescent moons, twisted wreaths, rosettes, stars and sun. The weapons represented include a sword, a shield, a shield with a sword, and a bow and arrow. 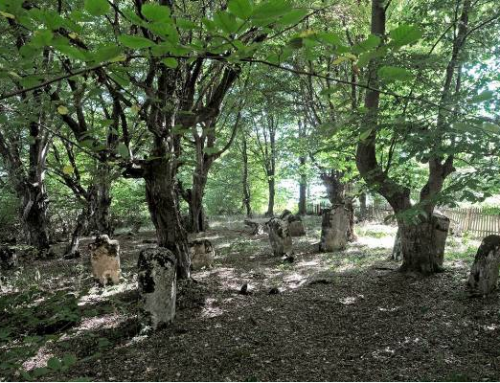 Wheel-dance scenes, human figures and hunting scenes appear on eight tombstones. Geometric and architectural motifs consist of cable-cord ropes, vines with trefoils and arcades. No inscriptions have been recorded. A Roman road that ran along the river basin of Trebižat, Mlada and Tihaljina represented a part of the Salona – Narona coastal main road. The road led to Imotsko polje from Narona over Bijača, Humac, Klobuk, through the valley Tihaljina, and from there to Lovreč, Trilj and Salona. 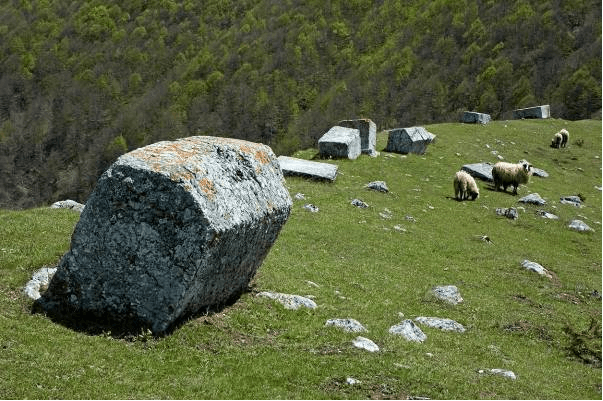 Two fragments of milestones with incomplete descriptions were discovered in Bijača. The plains around Ljubuški, Kutac, Zličine, Hrašljan and Humac were densely populated in Roman times, as evidenced by numerous finds (the remains of Roman buildings and other finds from that period). Humac near Ljubuški, is known for its numerous remains pointing to the fact that there was a military camp in the 1st century, probably in the Augustan period. The settlements in the area of today’s Ljubuški belonged to Paganija (the Neretva Krajina) in the 10th century. In the same century, Zahumlje (Hum) stretched between Dubrovnik and the Neretva River, and, at a later stage, its boundaries were extended to the Neretva River right bank reaching even the Cetina River. According to Grgur Barski (the file Sclavorum Regnum), the county of Velika (Veljci) covered the Ljubuški area – the villages of Grab, Orahovlje, Grabovnik, Veljci, Klobuk, Vitina and Ljubuški as well as the whole area eastwards towards Studenci where it bordered with the Luka county, somewhere between Studenci and the village of Trebižat. Towards the Luka county, it included the present-day villages of Stubica, Zvirići and Bijača and, in that direction, from Ljubuški towards the Neretva valley, it reached the Luka county, somewhere between Bijača and the village of Pruda, which was part of Luka. On the right bank of the Trebižat River, it included today’s villages of Vašarovići, Crveni Grm, Hardomilje, the area of Jezerac, today’s Rastovačko polje with Orah and the neighbouring villages on the Dalmatian side. The centre of the county was located in the area of the village of Grab and it was established by mid- 12th century at the latest. In the county of Velika (Veljci), there was the town of Ljubuški with a fort. In addition to the name Lubussa, there were other names for Ljubuški in the Middle Ages, such as Lubischi, Liubischi and Lublano. The National Museum in Sarajevo began, in the 1950-ies, a systematic study of necropolises with tombstones in Bosnia and Herzegovina. 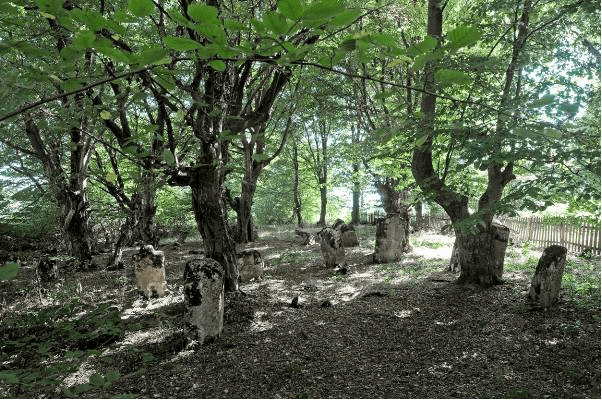 Thus, a detailed description of the necropolis Bijača has been provided. 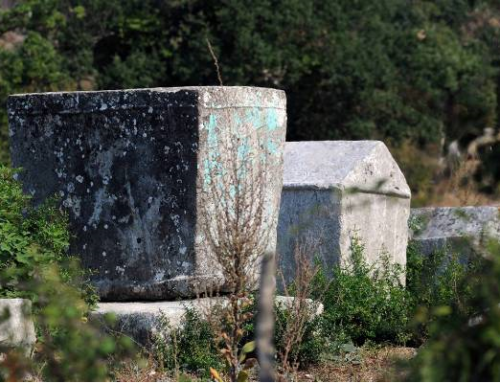 In the area of Ljubuški, 214 tombstones were registered at seven necropolises, of which 88 slabs, 78 chests, 1 chest with a base, 9 sarcophagi and 48 slabs and chests that were not individually described. Of 176 described tombstones, half of them are slabs, many are chests, while there are relatively few tombstones of sarcophagus type, but they are artistically decorated better than the others. Of 176 tombstones, 81 are decorated, of which 33 with the symbol of the cross, which came to the fore especially in Gornji Studenci. Decorative motifs on cemeteries with tombstones of the Ljubuški area are as follows: a shield with a sword, human figures with anthropomorphic decoration, a twisted rope and band, crescent, rosettes, trefoil tendrils, a wheel dance, a spiral motif, scenes of hunting, falcons and a tournament. 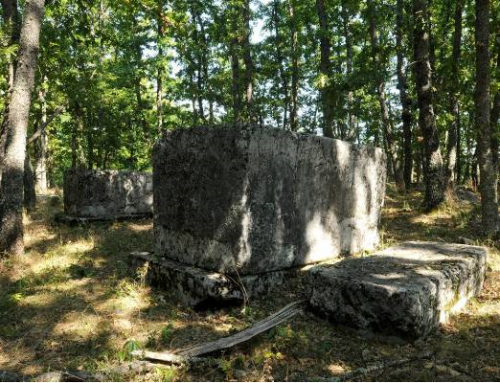 Tombstones are located at the Bijača site, within the plot called Mekota, next to the local Ljubuški – Vid road, in the immediate vicinity of the village of Donja Bijača. The necropolis is surrounded by dry stone. 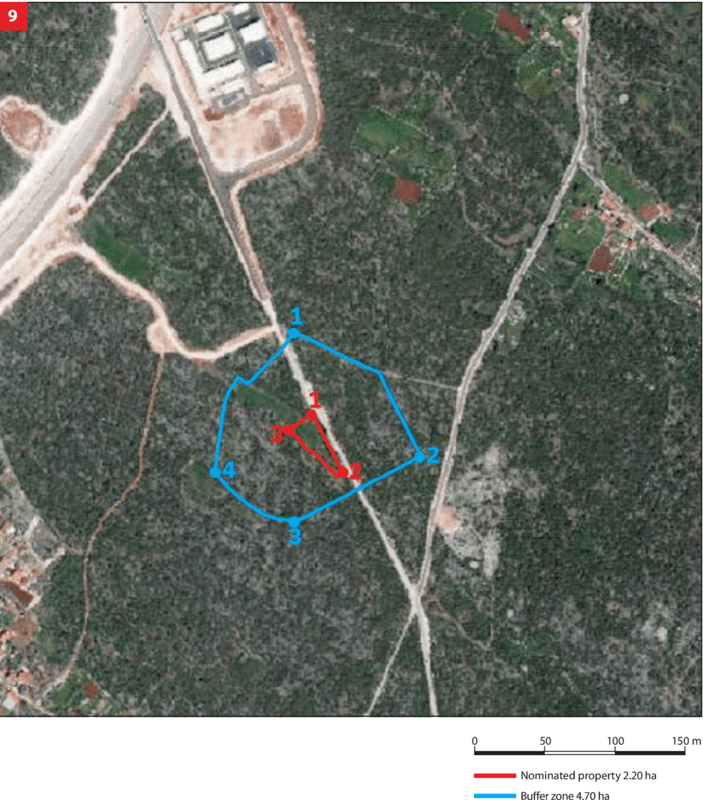 The condition of the site is not at satisfactory level due to the proximity of the road. 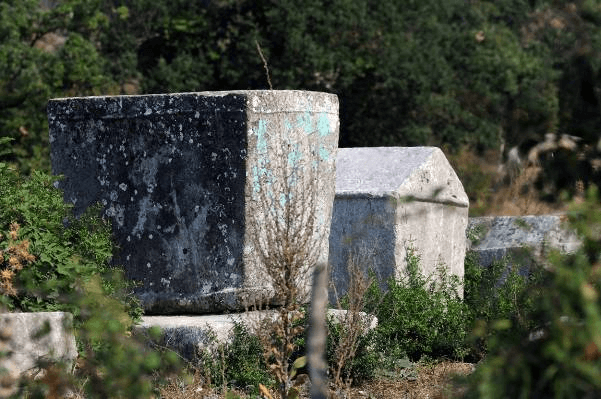 Out of the total number, 9 tombstones are placed below a causeway (below the Ljubuški – Vid road) – one tombstone is practically amorphous. As a result of environmental factors, decorations succumbed to the ravages of time and are not quite visible. 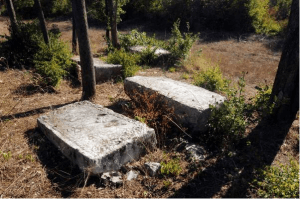 Several tombstones are damaged (tombstones with more superficial or deeper cracks, tombstones with damaged upper surfaces In 2011 the entire site underwent geodetic survey supported with photographs of individual tombstones thus enabling for implementation of a monitoring process. 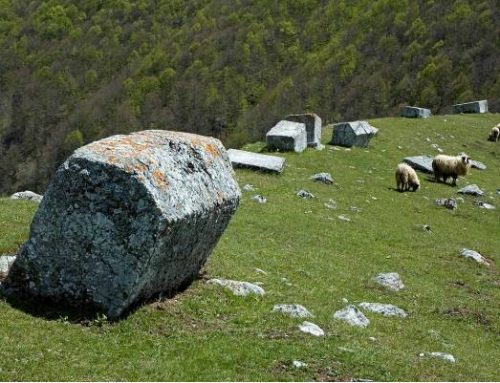 In addition, the tombstones at the necropolis underwent cleaning which implied chemical cleaning of lichens, chemical and then physical treatments of stones by sandblasting. This was followed by application of a protective coating to the stone surface. The damages on the stones were mended by two-component epoxy masses. 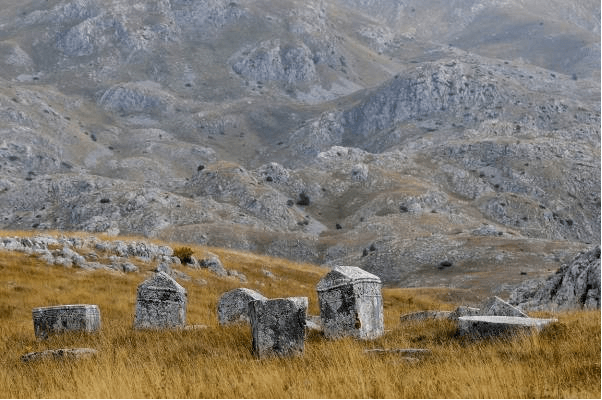 The necropolis with tombstones is located between the villages of Bijača and Zvirići, which together have a total population of 380. The site is accessible, though there is no information board. There are neither special protection and maintenance programmes nor organisations or persons that would take care of the necropolis. 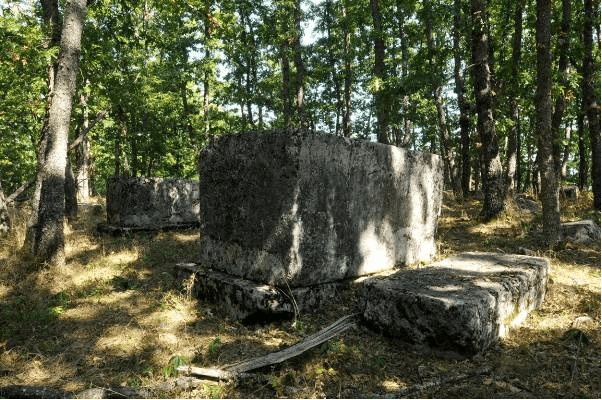 In 2010, the Ljubuški branch of Matica Hrvatska (Matrix Croatica) cleaned the site, marked it by putting an info board and published a guide-flier about the monuments in Croatian and English. The route of the Vc highway corridor where the Zvirići junction will also be built runs some 300 meters to the north of the cemetery. In the vicinity of the site there is a regional road, thus high frequency of traffic is expected to affect the state of the monument. The Spatial Plan of the Municipality of Ljubuški and the Spatial Plan of the West Herzegovina Canton are currently being developed. 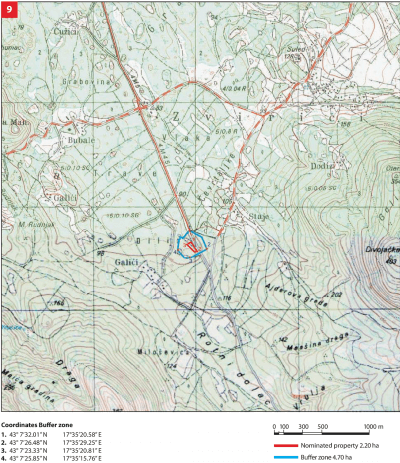 There is also the Tourist Master Plan of the Municipality of Ljubuški: http://www.ljubuski.ba. In 2010, 3000,00 BAM were spent on cleaning and presenting the site. Sources of financing: Ministry of Tourism and Environment of FBiH, Ljubuški Branch of Matica Hrvatska and Municipality of Ljubuški. The existing facilities at the site do not meet the requirements of organised visits or sightseeing. There are no parking lots along the road, though the possibility for their construction exists. There is a need to train tourist guides. There is only a brochure-guide (in English and Croatian) about the site, but it was printed in a limited edition and already distributed. There is no information on whether there are any other promotional materials about the nominated site. There are no formally employed personnel working on the site protection and management. Organisations operating in the Municipality related to cultural tourism: Tourist Board of the West Herzegovina Canton and the Ljubuški branch of Matica Hrvatska. The site is nominally included in the tourist presentation, but in fact it has no infrastructure which could support organised visits nor does it have qualified guides. 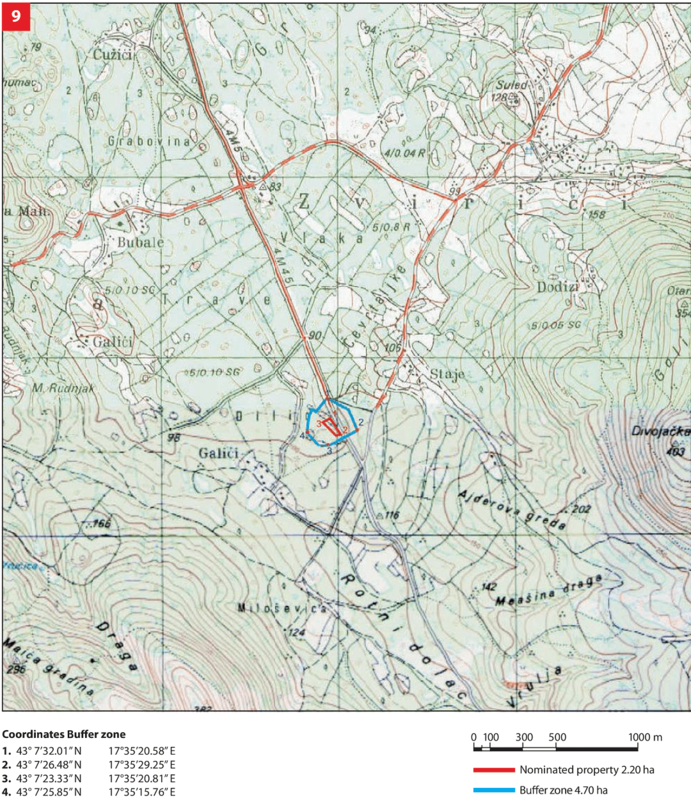 Currently (2012) there are no catering or other facilities in the vicinity of the site. Data on the number of tourist visits to the nominated site per year are not available.